In this warmly personal essay, the author recalls his solitary youth in working-class Hawthorne, California, and the books that helped open his life to the larger world of the imagination. "Every reader has a secret life," Gioia contends. In his case, the neglected library of an uncle he hardly knew became the portal to worlds of enjoyment and adventure, while providing insight into the mind of his long-departed relative. Dana Gioia, current Poet Laureate of California, is one of America's most celebrated poets. A native Californian, he has published three collections of poetry, as well as numerous chapbooks, anthologies, commentary, and two opera libretti. His book of poems, Interrogations at Noon, won the American Book Award in 2002. His noted 1991 book, Can Poetry Matter?, advocated for the revitalization of poetry in contemporary culture. From 2003 to 2009, Gioia served as Chairman of the National Endowment of the Arts. 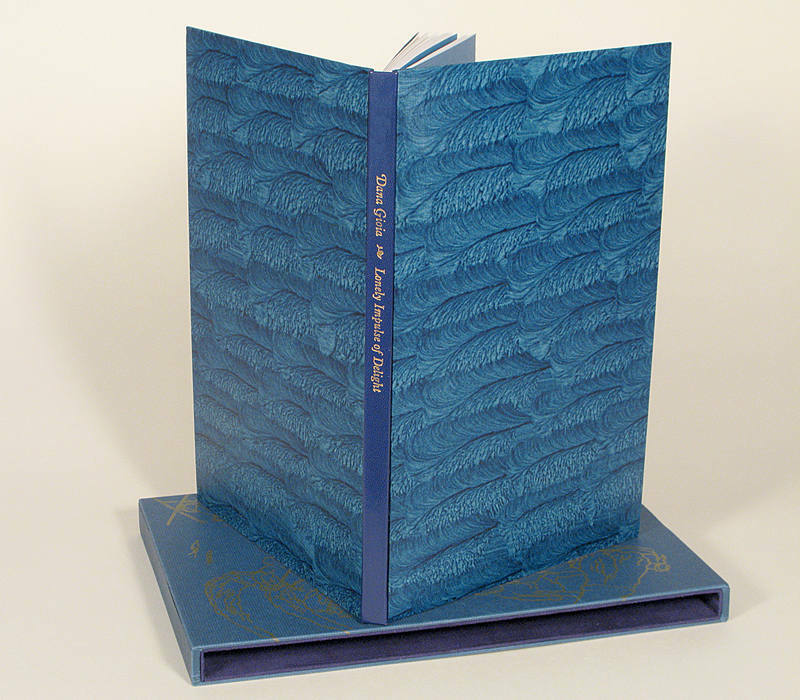 The book is beautifully enhanced with two etchings in color by California artist Kay Bradner. 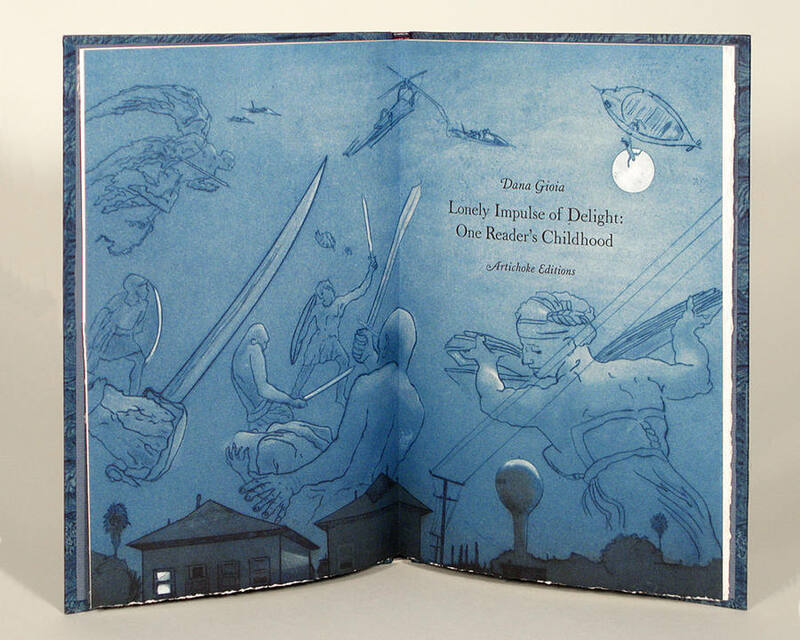 The double-spread title page depicts Gioia's hometown slumbering under a night sky filled with characters from the books of his childhood. A vignette of a boy reading with his younger brother resting by his side serves as a tailpiece. 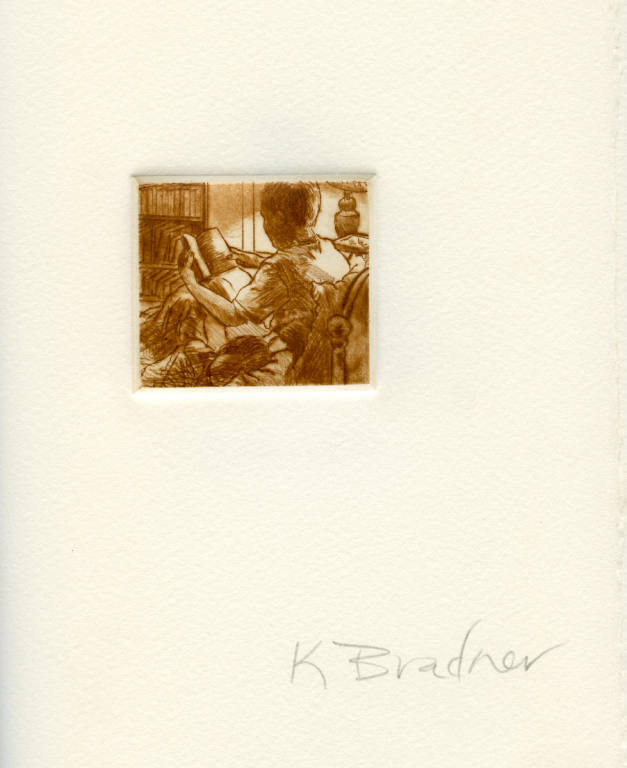 Kay Bradner's pioneering work in intaglio printmaking has established her as a major contemporary artist. Collections holding her work include the Metropolitan Museum of Art, the San Francisco Museum of Modern Art, the Portland Museum of Art, and the Brooklyn Museum. 50 copies, signed by author and artist, 24 pages 10 x 6.5 inches. 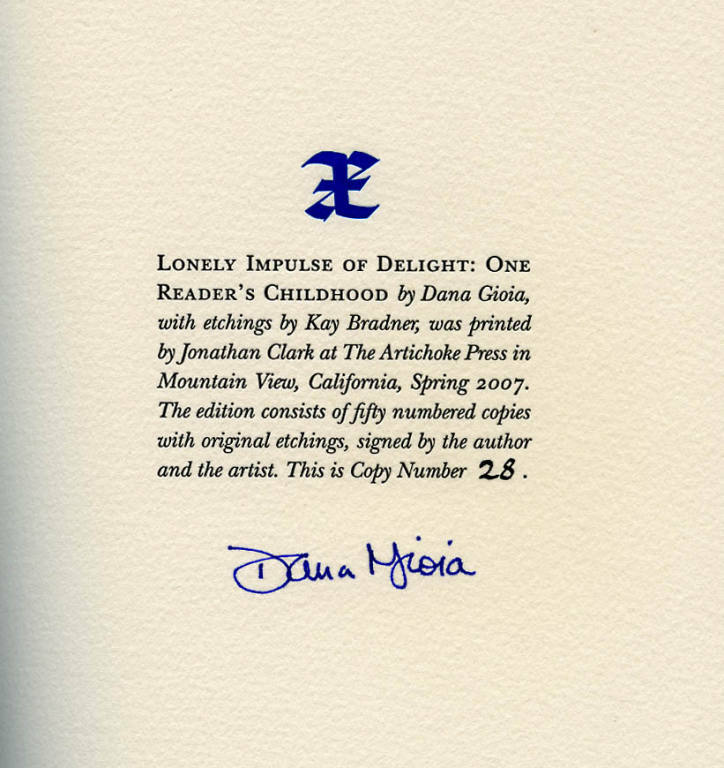 Printed in 2-color letterpress by Jonathan Clark at The Artichoke Press, on Arches rag paper. Title-page and endpiece etchings printed by Kay Bradner. Initials and ornaments by Ward Dunham. Hand-bound in antique Swedish paste-paper boards and goatskin spine titled in gold. Enclosed in a suede-lined slipcase.